One of our daughters and son-in-law like to spread out gift giving with their four young children. They will open one present per child (or a group present, such as a game) one day at a time. There are several reasons they do this and one is so that each gift can be enjoyed by itself for a time. After participating in this celebration for several days last week, I saw that there was certainly merit in this approach. It also led to one of the funniest gift opening situations I have witnessed in my 61 years. This particular evening after a lovely meal and story time, the three boys, aged 5, 3, and 2 were told to put on their pajamas and they would be able to open a present together. There was a rush upstairs to change and as they returned to the living room in front of the tree, a single, long, rectangular present lay wrapped and waiting. The boys were told to open it together. Without hesitation – they tore the wrapping paper off and opened the box. I only wish I had a video of what happened next! They took the top off and inside were three styrofoam swords. There was a brief moment of recognition….and instantly each grabbed a sword and began “sword fighting” with their brothers. They really went at it! All three knew exactly what to do with their swords and they even had accompanying sound effects… ARGGHH! I couldn’t stop laughing! Little boys love swords. 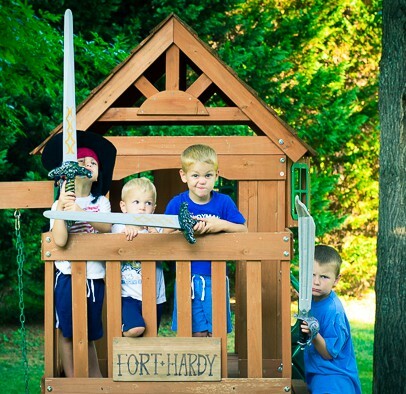 These swords were from the Dollar Tree and may not last long, but they were a big hit. No one was injured and sword fights continued to break out the rest of our visit. Nana even engaged in some sparring herself! Now I must confess that we avoided buying any guns or weapons when our children were little. We did not want to encourage aggressive behavior. Yet, it didn’t take long for them to find sticks, pieces of wood, and discarded cardboard from which to fashion a weapon. They even used dried stalks from Joe Pie weeds to “sword fight”. It struck me how naturally these little boys took to their swords and were ready to fight imaginary battles with each other. It also led me to reflect on the real battles they will face throughout life. How can we prepare these little ones to face real battles? What will they do when they are faced with pressure to cheat or steal? What if they are challenged to pick on someone? How can we make sure that they will respond instantly – and make the right choice? This Bible verse draws an important analogy – God’s Word is the Sword of the Spirit. If our children know God’s Word – if they memorize Bible verses and learn principles from Bible stories – these will equip them to respond to real life battles in positive ways. Joseph, Daniel, Esther, and Mary all responded to difficult situations and came out victorious. These people are great examples for our children since these people faced real life challenges. Resolve this year to help your children be equipped with God’s Word.